We have “no time” most of the times and we were no different. When we were informed about the launch of “Accessible India Campaign” at Mumbai, something in us strongly told that we must make it. And we did. This simple “doing” did a significant “difference” in us before and after the event. On September 24th 2015, we spent almost 7 hours at the launch and sessions of “Accessible India Campaign”. The first hour was the inaugural by Chief Minister of Maharashtra Shri. Devendra Fadnavis, in the presence of few other ministers, Govt. officials (Mr. Mukesh Jain, Mr. Awanish Kumar Awasthi) and actor Shri.Vivek Oberoi. Each of them spoke very briefly and these brief talks of each one reflected a strong intent and sincere commitment to make India Accessible to the specially abled people. The best part is that the Government initiative is very strategic in nature and the officials exhibited great commitment both while addressing the audience at large and in their personal one to one interactions. Chief Minister Shri. Devendra Fadnavis gave a short but a high impact speech. He mentioned that while western world says “survival of the fittest”, we believe that “whoever has taken birth has a right to survive”, and as a Government we must and we will enable that. The “Accessible India” strategy document addresses three core areas – (1) Built Environment Accessibility (2) Transportation System Accessibility and (3) Information and Communication Eco-system Accessibility. Objectives for each and Targets have been clearly laid out to guide implementation. The workshop sessions post the inaugural of the campaign had – people who have already been working for years towards the noble cause of making India accessible, academicians, experts, officials, etc. The sessions enabled participative discussions in (1) Accessibility of Built Environment (2) Accessibility of Public Transportation (3) Accessibility of ICT. Accessibility of Airports/Railway Stations in a phased manner. Emphasis on Assistive Technologies – Technology is a great solution provider. We met these specially abled people who have already been working since years to make lives better for other specially abled people in their own way irrespective of the support form Govt./Institutions. This only made us wonder who is really disabled – we who have everything, we are actually humanly-disabled because we don ’t appreciate what we have been blessed with, and miss out opportunities to be at the service of the specially abled people in whatever small or big way we can. We realized that people are already doing great things, a structured and strategic support from Govt. can synergize the noble intent. Additionally, support from citizens at large can be a great catalyst in speeding up the whole process. “Take the lead, we assure all help to whatever extent in whatever form”, appreciated work of organizations like Voice of SAP. Highly appreciated the work of Shri. Pranav Desai and stated “ Yeh Sab Unka Hi Hai” (all this is his idea). Showed keenness to work together with Voice of SAP. Mukesh Jain, Joint Secretary, DEPwD, MSJE. 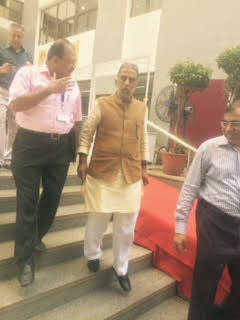 He was happy to know the presence of Voice of SAP team at the session and spoke highly of Shri. Pravnav Desai’s commitment to the cause. He assured all the support in Voice of SAP’s endeavor. Shri Pranav Desai, Founder, Voice of SAP, is immensely committed to making the great change happen, we being a part of his team is a privilege and a blessing.